​If you’re a C.E.O., there are a lot of ways to leave your job, from abrupt firing to carefully planned succession (which may still go spectacularly wrong). In this final episode of our “Secret Life of a C.E.O.” series, we hear those stories and many more. Also: what happens when you no longer have a corner office to go to — and how will you spend all that money? Ellen PAO: The board didn’t have the stomach for it. And that ended up being the reason why they asked me to leave. Steve BALLMER: I got kind of riled up about that topic and I didn’t think it was handled well. Jack WELCH: The reason I left was not that I was tired. Indra NOOYI: The day you become C.E.O., you have to think about grooming a successor. Richard BRANSON: I mean, you can maybe get just a little bit too many selfies in a day. WELCH: Well, I give him a D-minus on management practices. Also: what do you do with all that money? BALLMER: I own a basketball team. David RUBENSTEIN: I bought the Magna Carta. BARTZ: Uh, I am going to have a quesadilla. We’ve spent the past several episodes speaking with the C.E.O.’s, past and present, of Facebook, Microsoft, PepsiCo, General Electric, Virgin, Yahoo, the Carlyle Group, Bridgewater Associates, and Reddit. Also, the academics who know them best. The first episode looked at what a C.E.O. actually does, and why they’re paid so much. We followed that with a look at how our C.E.O.’s got to the top. Next was an in-depth conversation with Indra Nooyi of PepsiCo, a conversation that was turned into a global meme called Lady Doritos. The episode after that was — fittingly — about crisis management; and then a look at why female C.E.O.’s are so rare, and why they’re often asked to run companies that are in trouble. On today’s episode: the end of the road. It’s a road that, from what we’ve been hearing, is fairly exhausting. NOOYI: Today I woke up at 4 a.m.
BRANSON: I was starting a company without financial resources. RUBENSTEIN: I try to read two books a week. BARTZ: I fought so hard against that, and fought, and fought. The worst way to go, I think we’d all agree, is involuntarily. That’s what happened to Carol Bartz, who was fired from Yahoo after just a couple of years. The chairman of the board fired her by phone. BARTZ: He didn’t have the nerve to see me face to face. Now, I’d like to think he didn’t have the nerve because he knew I would probably punched him out. Ellen Pao was interim C.E.O. of Reddit. She says she was pushed to aggressively grow the company. PAO: I had warned the board like, “This is going to be pretty ugly. It’s going to be a mess for a while. It was a mess. Pao lasted just eight months. PAO: At the end of the day I think the board didn’t have the stomach for it. But she’s still working — back in venture capital, where she came from. PAO: I am the chief diversity and inclusion officer at the Kapor Center, and a venture partner at Kapor Capital. BARTZ: I love quesadilla. I just think it’s so simple. Tortilla, cheese, and whatever you have. And, for the pleasure of being fired from Yahoo in 2011, Bartz walked away with a compensation package of roughly $16 million. Golden parachutes are standard issue for fired C.E.O.’s. Here’s Jeff Sonnenfeld of the Yale School of Management. SONNENFELD: You know, Carly Fiorina, who sliced shareholder wealth in half at Hewlett-Packard and created a chaotic, strategic pileup of computer carcasses and made the company larger and far weaker — she somehow had a huge package to leave. A package that was reportedly worth something like $100 million. One reason C.E.O.’s are paid so much, both during their terms and even afterward, is that the job has become increasingly difficult. RUBENSTEIN: You know, in the 1950’s, C.E.O.’s, basically they got the job and they could stay until they were ready to retire. David Rubenstein is a co-founder and, until recently, co-C.E.O. of the Carlyle Group. It’s one of the biggest private-equity firms in the world. RUBENSTEIN: I think it’s much harder today, because today you have much more scrutiny of what you’re doing. It used to be the case that activist investors were not taken that seriously by boards. Now an activist can, with 1 percent or 2 percent of the stock, really change who the C.E.O. might be or change the direction of the company. I think the scrutiny, in terms of everybody in social media watching what every company is doing all the time, is much greater than it used to be. Today, the scrutiny, and the pressure, can be relentless. Even for someone who’s had great success, like Satya Nadella. NADELLA: Thank you so much. Nadella, the C.E.O. of Microsoft, isn’t close to retirement: he’s only 50, and got the job just three years ago. Already he’s been credited for pulling the company out of a serious stall. Microsoft’s market cap has risen roughly $400 billion since Nadella started. NADELLA: The idea that a lot of progress has been made is not how I look at it. We are clearly grounded in all the things that we can do better — whether it’s the products we build, the capability we create, or the culture we have — and on all three fronts, I feel there’s a lot to be done. I’m proud of some of the progress, but it’s not sufficient. DUBNER: Obviously, the role of C.E.O. is vast, and there are many duties and obligations. There’s deal-making. There’s strategic planning and customer relations and technical elements — you are, after all, an engineer — and daily personnel management. Can you rank for me your different duties from least favorite to most? DUBNER: And would you say podcast interviews rank closer to the ribbon-cutting or the meeting with engineers? NADELLA: You know, talking to you is one of my great pleasures. DUBNER: All right, now I know you’re a good liar because that sounded very credible. NOOYI: You are “it.” When you become C.E.O., overnight you are the person calling all the shots. It’s a very daunting job. BARTZ: People don’t talk about this a lot — but it is a very lonely job. Nicholas BLOOM: It’s hard for C.E.O.’s, I think, to get fully candid advice because they’re there at their own on the top. That’s Nicholas Bloom, an economist at Stanford. BLOOM: It’s hard for them to talk with their peers. Remember there’s anti-trust. So, if the C.E.O. of McDonald’s would start to talk to the C.E.O. of Kentucky Fried Chicken, they’d be taken to court. So they can’t really talk that well to their peers, so who can they talk to? The people below them who are never fully honest. We’ve seen it over the centuries, millennia, with kings that are lonely at the top. They surround themselves with courtiers and advisers. And on the one hand, they want honest advice. On the other hand, they have a tendency — particularly in medieval England — to chop the heads of the people that didn’t agree. As I said, this sentiment came up in several interviews. But not every interview. WELCH: All that crap about lonely at the top — it’s nonsense. Pure nonsense. That’s Jack Welch, former longtime C.E.O. of General Electric. WELCH: No, it’s not lonely at all. That’s the biggest myth in the world. You’ve got your friends there, you’re all sharing everything you have. I mean rarely do you have such an opportunity at a job to totally change lives, make people rich, send their kids to college, get vacation homes? I mean, it’s a turn-on. I used to call guys in my office and give them a million bucks. Do you realize how good that feels? And some of them would cry. Here’s a million dollars’ stock. They go home thrilled. Think of the party they’re having in their house that night. BRANSON: No, I don’t get lonely. I mean, I love people. That’s Richard Branson, founder of the Virgin Group. He started with one record shop and now has dozens of companies, including the space-travel firm Virgin Galactic. BRANSON: Maybe I’m lucky, I don’t know. But I mean, there are occasions, because I’m a recognizable face around the world, that I can maybe get just a little bit too many selfies in a day. DUBNER: Is that why you want to go to space? To avoid all that? BRANSON: Well, maybe that’s why I live on an island, anyway. DUBNER: You’ve admitted that Virgin Galactic may not be the best bang for the buck when it comes to maximizing profits. You also admit that the Virgin board has not been thrilled with the endeavor. Why is this so important to you? BRANSON: You only live once. And there are millions of people who would love to become astronauts, who would love to go to space. Me included. And I love a challenge. Perhaps the biggest challenge for any C.E.O. is the transition. Whether it’s sudden and involuntary; or a well-executed succession plan. NOOYI: The day you become C.E.O., you have to think about grooming a successor. Indra Nooyi has been C.E.O. of PepsiCo since 2006. NOOYI: How do you, you know, take people and give them bigger assignments? It wasn’t always thus. The process of grooming and choosing a successor wasn’t always so … methodical. SONNENFELD: Who is that person? Shouldn’t we all know who that is? Certainly we on the board should know. What’s the training that person has? What’s their preparation, and what are the alternatives? Have we benchmarked some people against the outside? That was the way things were in the 70’s. SONNENFELD: In the 1980’s, people were being stacked, whether or not it was through mergers or whatever, commitments were being made. Okay, this person will be the next C.E.O. We were coming out with some very recipe-like H.R. practices , that somebody is ready now, and ready in five years, and whatever. And who was responsible for writing these successor recipes? SONNENFELD: There was often a czar of some sort, of executive development, that would report directly to the C.E.O., that had tremendous king-maker or queen-making power. You were worried about that person. They were legendary. They could derail people’s careers. There was a lot of personal prejudice and ethnic and gender, racial bias, often built into those roles. So that was a real problem in the 80’s. Okay, glad we’re out of the 80’s. What about the 90’s? SONNENFELD: Then, you know, we started to see the supremacy of certain functions — that, with all the deal-making frenzy, that somehow finance had this primacy and C.F.O.’s had raced past C.O.O.’s. One firm that participated in that deal-making frenzy was General Electric, under Jack Welch. He stepped down in 2001, having run G.E. for 20 years. DUBNER: You’d been there a while, and you were getting on in years, but I’m guessing if you’d really wanted to you could have powered through some more years. How do you know as a C.E.O. that it’s time to go? WELCH: The reason I left was not that I was tired. The problem was you have expectations in the bureaucracy; and the expectations of these talented, wonderful people. I didn’t do it because I was tired or bored. I loved it. I did it because it was the right thing to do for the rest of the people. And I would have expected it when I was there. That there’s a certain rhythm; and 65 was the rhythm in G.E. Meaning Welch was going to be 65 years old and it was time for someone else to have their turn at the top. He and the G.E. board meticulously plotted his succession. Their candidate list began with two dozen names. “Over the next four years,” Fortune magazine reported, “Welch tried to fill the gaps in all the candidates’ resumes and test their ability to grow.” Finally, the two dozen were narrowed down to three. After another round of auditions, Welch and the board made their decision. The two who didn’t get the job indeed wound up as C.E.O.’s elsewhere. Jim McNerney at 3M and, later, at Boeing. And Robert Nardelli at Home Depot and, after that, at Chrysler. The man who did get the G.E. job? Jeff Immelt, who would go on to run G.E. until 2017. His record was, at best, mixed. The firm’s value fell a great deal. Some blamed Immelt; some blamed economic forces; and some blamed Welch for having built a conglomerate with so many moving parts that it was unsustainable. Welch famously pushed G.E. well beyond its manufacturing and technology roots into businesses like insurance and financial services — businesses that G.E. has since sold off. WELCH: No. I thought we had tons of leverage there. We had a great balance sheet. We had talent in financial services. We had our own homegrown financial management program where we could put people. We build great businesses. And I would still be in it if I was running it. WELCH: Well, that that’s not — that’s not the businesses they bought. DUBNER: So you’re saying that you would not have the divested the financial-services stuff if you were still runn—? WELCH: No, I’m not saying that. I am saying that I might not have gotten in the trouble that they got in by exploding in real estate, but that’s second-guessing. You can’t second-guess a C.E.O. That happened eight years after I left. That’s the normal tenure for two C.E.O.’s. To talk about what I would have done or what somebody else would have done when I was there is unfair. WELCH: You can comment on it in any way, where you want. But I’m not — I haven’t commented on my successor once in 20 years. And I don’t intend to comment now. You can judge me any way you want, on whether I picked the right guy or not, you gave numbers. And one, from those numbers, would question how well I did. But I’m not commenting. And I — if you want to give me a black mark, give me a black mark. I did the best I could. I picked the guy. WELCH: My predecessor came up with it. He never commented on me. And I radically changed everything he did. And he sat quietly and was a friend. The transition from Jack Welch to Jeff Immelt was considered so sensible, so thorough, that business schools taught it as the perfect example of how to search for, and install, a successor. Oh well. It doesn’t mean it wasn’t sensible and thorough, or that Immelt was the wrong man. It just means that business is hard — and most big firms throughout history do lose their mojo. The C.E.O. who recently replaced Immelt, John Flannery — he’s not having a very good time either. When we spoke with Welch, G.E.’s market cap was just above $200 billion; it’s since fallen to roughly $130 billion. RUBENSTEIN: Generally, the companies that are going to make it are the companies that have a C.E.O. founder who has driven the company for the first couple of years. That, again, is David Rubenstein of the Carlyle Group. He’s worked with, and seen, every kind of C.E.O. transition imaginable. In medium-sized firms looking to get bigger; in big firms looking to reboot; and — what he’s talking about here — in startups that outgrow their C.E.O. founders. RUBENSTEIN: And then you bring in a C.E.O. who’s better at managing a more mature company than somebody who’s getting it off the ground. DUBNER: What about when the startup C.E.O. wants to stay and plainly isn’t the right person for the job, how do you handle that? RUBENSTEIN: It can be a very complicated conversation. Typically outside investors may have the majority voting stake or the majority of the board by years three or four, and they might have the ability to vote out the C.E.O. But it’s not pleasant. So sometimes you give the C.E.O. different responsibilities. BRANSON: I’ve delegated pretty well all the C.E.O. roles. And that, again, is Richard Branson of the Virgin Group, a conglomerate with many companies in many industries. Branson started Virgin when he was a teenager; now he’s 67. BRANSON: And I actually believe that people should delegate early on in their businesses, so they can start thinking about the bigger picture. We accept that some things they’ll do differently than us. Some things they’ll do better than us. DUBNER: It strikes me that even the most public-facing of those C.E.O.’s is much less public-facing than you. In many ways the Virgin brand is really Richard Branson. That, at least, is my assessment. I’d love to hear your assessment and how you see yourself as a representative of your firm. BRANSON: If you go back to when I was 15, 16, I didn’t have any money and I was starting a company without financial resources. So you know I would do anything I could to get Virgin on the map, even if it meant jumping in boats or balloons, and trying to break world records, etcetera. I think that worked. I think the Virgin brand is here to stay and hopefully will outlast me, and that was the original plan. DUBNER: You know, that’s what I wanted to ask you next, I’m glad you brought that up. What would Virgin look like beyond Richard Branson? And I’m curious if you think about succession. BRANSON: Well, I would be irresponsible not to. First of all, we’re — all the companies are run by wonderful people. We have a chairman and chief executive who run the group on a day-to-day basis. And I’ve got two wonderful children who, you know, do their own thing, but they — they dive in and out. But I’m still enjoying myself. So for the next 10 or 20 years, I’m still going to be very much involved, I hope. SONNENFELD: He is kind of elusive. SONNENFELD: He’s a moving target. He, I think, has an inspirational quality. No matter what the crisis is, or the success is, it’s very Richard-centric. You can’t list a, you know — with Jack Welch, you can list — like them or not, you can list 20, 25, 30 very high-profile, and for the most part, very successful progeny. Some of them loved him, some of them didn’t, but it’s very strong record of leadership creation and identification. With Branson, I don’t know, can people name one, two, three? That is a sign of a grandiosity that isn’t something which is generally used as a yardstick, outside of the world of entertainment. So Jeff Sonnenfeld, as a C.E.O. observer, isn’t so impressed with how Richard Branson has managed the next generation of leader. There’s another founding C.E.O., of a much younger company, that Sonnenfeld also disapproved of. SONNENFELD: I thought he showed an incredible audacity to not learn and listen as a leader. He’s talking about Mark Zuckerberg of Facebook. SONNENFELD: He was obviously technologically brilliant but self-absorbed if not even disdainful of the people who were giving him the money to make him so wealthy, sending out videos of himself with the hoodie on, not going out and meeting on the road shows with investors. At least that’s what Sonnenfeld used to think. SONNENFELD: Oh my gosh, has he changed. He’s a reminder that, yeah, adults can learn and grow. He had a great board, great mentors, and also he’s just been a great learner. He has been remarkably different now as a leader than he was when he first became C.E.O. ZUCKERBERG: The real art I think is not when you know that you have someone who is a superstar, who is going to make great decisions, but deciding to let people do things that you disagree with, because on principle you know it’s just going to free up more creativity and people will feel like there’s more potential to try different things in the future that may be better, if you let them go do those things, even if you disagree with them. Ray DALIO: Well first of all, I know that I don’t know how anything is going to go until I actually experience it. That’s Ray Dalio, the founder of Bridgewater Associates, the world’s largest hedge fund. DALIO: I have a saying: if you haven’t done it three times successfully before, you probably don’t know how to do it. DALIO: I was so wrong, I had to let clients go. I lost money. I got so broke that I had to borrow $4,000 from my dad. Bridgewater is not a typical company. Built in Dalio’s image, it became famous for practicing what he called radical honesty and radical transparency. It wasn’t for everybody. But it worked. Today the firm manages roughly $160 billion. DUBNER: I’d love you to talk for just a second, Ray, about when you stepped down as C.E.O. a few years ago and installed a new C.E.O. but then had to step back in as temporary co-C.E.O. I’m just curious what happened? What did you miss? DALIO: So I realized the transition from a founder-owned company to an independent company is classically very challenging. And so how do you approach that? How do you strike that balance? I wanted to be totally a mentor: being there for other people and letting them do it the way that they wanted to do it. And then I found myself in the surprising position of having them struggle with that — unacceptably struggle with that. DUBNER: And this was a guy who you’d hired as a kid, essentially, and had been around forever and I gather were very close with, yes? DALIO: Yeah. You know for like 20 years. And I, you know, I love the guy. I mean, literally wonderful deep relationship brilliant man. And I think it was largely my fault too. I think I gave him too much. You know, when the business grew up, there were two things: I had to get my head into all the investment and economic stuff that I do. And then also run a business simultaneously. And any one of those things is too much for any human being, me included. And then to take that and then sort of to give it to this person — I made the mistake essentially of giving too much. The man in question here is named Greg Jensen. He’s still at Bridgewater, but as co-C.I.O. now, chief investment officer. DALIO: So we had that evolution. But we didn’t anticipate it. Jensen and Bridgewater were in the news again recently. The Wall Street Journal reported that Bridgewater had paid a settlement of more than $1 million to a former employee Jensen had an affair with, apparently while he was running the firm. He was also accused of sexually harassing at least one other female employee. Jensen called the report “inaccurate and salacious”; and Dalio defended him as “a man of high character.” Whether Jensen’s behavior contributed to his demotion is unknown. But when he was demoted, Ray Dalio stepped back in to co-run the firm, along with a tech executive recruited from outside Bridgewater. That guy lasted less than a year. Finally, in April of 2017, Dalio put Bridgewater in the hands of two longtime insiders, and he remained, along with Greg Jensen, co-C.I.O. So what happened that Dalio was finally ready to step down again? DALIO: We learned a structure. And I learned a whole bunch of things that I never understood before, like about governance. That’s the thing about being C.E.O. of a firm you started. It’s your firm. It’s got your shape, and idiosyncrasies. Part of the reason people start their own companies in the first place is to escape the cookie-cutter mentality. But that can leave you, as it left Dalio, with a lot of blanks to fill in later, during a C.E.O. transition that lasted a lot longer than he had anticipated. DALIO: How do you do the right checks and balances? Should you have a board? Should you do not have a board? What are the processes and all of that? So it became a learning process — that evolved over seven years. Another founding C.E.O. who recently stepped down, but not aside completely, is David Rubenstein. His new title is co-executive chairman. RUBENSTEIN: I have a theory that if you retire you go downhill quickly, and I have a theory that if you relax too much, your immune system relaxes, germs come in, and see a relaxing immune system, they attack, and all of a sudden you’re in trouble. So I don’t want to relax too much, because I’m afraid that bad things will happen. Jack Welch is another former C.E.O. who’s kept very, very busy. WELCH: I started my own school. It’s called The Jack Welch Management Institute. Which is … what exactly? WELCH: An M.B.A. program online, fully online, fully accredited for working adults. WELCH: I’ve given thousands of speeches around the world. I’ve taught at M.I.T. for six years. RUBENSTEIN: I concluded that with respect to golf, that it was too frustrating and too humiliating. Because I have the view that if I have a business meeting with somebody, and they think that I’m competent and intelligent, if I were to go on the golf course, I would destroy the illusion of competence and intelligence. BALLMER: I really love golf. My first year I retired, I played 100 rounds. That’s Steve Ballmer, who ran Microsoft from 2000 to 2014. So plainly he’s in the pro-golf camp. Ballmer’s departure from Microsoft was a bit messy, with some hurt feelings. DUBNER: I’m curious, going forward, how much you care, or I guess how do you care about Microsoft’s future success? BALLMER: Well, when I ran Microsoft, I was always consistent in saying, “The number one measure of whether I did a good job or not would be what Microsoft would look like 10 or 15 years after I left.” And so I can’t do anything at this stage. You know I’m just I’m just an outside, independent guy. On the other hand of course I’m rooting for the company for three reasons: I’m a shareholder; because it is the mark of whether I did a good job or not, and part of that is the succession plan; and oh, by the way, I got a lot of friends who work over there and I think the world of. And don’t be fooled by all that golf Ballmer plays. He’s got a lot of other stuff going on. BALLMER: Hoopers, hoopers, hoopers! I own a basketball team. The Los Angeles Clippers is Ballmer’s team. He’s also involved in a lot of philanthropies, including a website called USAFacts, which synthesizes 30 years’ worth of data from federal, state, and local governments. It’s a sort of fiscal colonoscopy of the American government. BALLMER: If I’m a citizen I don’t want to know just where the government got its money, from whom, and where it spent it. But is it working at all, or at least what activity is it generating? Do we like the kind of outcomes we’re getting? That’s the thing about the afterlife of the C.E.O. You’ve got money. You’ve got connections. You’ve still got name recognition, if not as much actual leverage. But you’ve also got freedom of speech. Being a C.E.O. often means trying to never say anything to anybody that any other person could possibly construe as controversial. The idea is probably best expressed in a quote, from long ago and quite possibly apocryphal, attributed to the basketball superstar and endorsement machine Michael Jordan. There was a Democratic senate candidate from Jordan’s home state of North Carolina, Harvey Gantt, who wanted Jordan’s support. Gantt is black, as is Jordan, and Gantt was running against an old-school, white Republican incumbent, Jesse Helms, who was widely viewed as a racist. But Jordan declined to support Gantt. Here’s what he reportedly said: “Republicans buy sneakers too.” Michael Jordan was smart enough to know that he even though he was still a basketball player, he was also the C.E.O. of Michael Jordan, Inc. So most C.E.O.’s are as anodyne as it gets, especially about politics. But when you’re no longer speaking on behalf of your firm, you can say whatever you’d like. Take Jack Welch. Here’s what he said in the fall of 2017 when I asked why he hadn’t quit President Trump’s business-advisory council, like many other C.E.O.’s did, after Trump spoke out in defense of a white-nationalist protest in Charlottesville, Virginia. WELCH: I felt you’re better off inside the tent, staying on the commission, seeing him, making your position known, than being outside. So I was one of the two or three that disagreed. But I wasn’t an active C.E.O. I was the only retiree on there. So I didn’t bang the table; but I thought it was a bad decision, just to express your frustration. But I understand if you got a lot of employees and they’re rebelling over it, you might want to get out of town. DUBNER: What’s your assessment so far of President Trump’s leadership style? WELCH: Well, I give him a D- on management practices. And I give him an A+ on policies. DUBNER: Do you think you think you could run him through your management institute and get that D- up to a B or something? WELCH: I guess this is a guy that ran his own company, So he does things like — I didn’t disagree with removing James Comey; I disagreed with the way he did it. But he abandons soldiers in his army very quickly. Leaders of a corporation wouldn’t do that. DUBNER: Do you think someone of his age, experience, and position, now, with everybody watching every move, do you think it’s possible for someone like that to change as fundamentally as you’re suggesting he change? WELCH: We’ll see. I think he’s changed. I think he’s changed for the better in many ways in some speeches he gives. But the consistency isn’t there by any means. I mean, he gives a U.N. speech that was remarkably effective. First-class. And by the weekend, he was having a fight with the N.F.L. You didn’t hear another day of the U.N. speech. David Rubenstein, of the Carlyle Group, doesn’t shoot from the hip like Welch. In fact, his career has been marked by a quiet sense of discretion and propriety. Here’s what Jeff Sonnenfeld of Yale said when he learned that Rubenstein was stepping down as C.E.O. of Carlyle but was going to stay on as an executive chairman. SONNENFELD: So it’s a shame, only that he’s stepping down. If he was to be moving beyond Carlyle, you would have prayed that he could have been lured into any presidential administration. You could almost randomly look at any cabinet position, for example — literally whatever role it was, it would be better served with him there. Rubenstein has been a Washington fixture for decades. He’s recruited many former politicians to work at Carlyle. He himself got his start in the Carter White House. RUBENSTEIN: So at 27, I was the deputy domestic policy adviser for the President of the United States, a job I obviously wasn’t qualified for. DUBNER: Now, I’ve read that you stayed late at your job to make sure that your memos were on top of the President’s briefing pile. RUBENSTEIN: It’s, for better or worse, completely true. DUBNER: And I’ve read that your net worth is a little north of $2.5 billion. Is that accurate, if you care to confirm or not? RUBENSTEIN: You know, I’ve never calculated it. I see what Forbes says. It’s more than I ever dreamed I would have. I have signed the Giving Pledge. And I’m committed to giving away not half of the money, as the Giving Pledge suggest that people do, but to giving it all away. So whatever it is, I will give it away. His giving is already well underway. In fact, you have to wonder if Washington itself might be crumbling if not for David Rubenstein. He gave $18.5 million to restore the Lincoln Memorial; $7.5 million to repair the Washington Monument after earthquake damage; $75 million to the Kennedy Center; $2 million to the National Zoo, to bring in some elephants. He also buys a lot of historical documents and has them put on public display. RUBENSTEIN: I bought the Magna Carta, and then other historic documents like the Emancipation Proclamation, or rare copies of the Declaration of Independence, or the 13th Amendment came to me, and so I buy them. I bought the first book ever printed in the United States. DUBNER: What was the first book ever printed in the United States? RUBENSTEIN: It’s called the Bay Psalms Book, printed in 1640. The first printing press was brought here in 1638. This was the first book printed. There are about seven copies. One was auctioned off a couple of years ago, and I won it, and I paid the highest price ever paid for a book. I’m not sure I’m happy to brag about that. I think it’s about to be put on display at the Smithsonian. Why is this how Rubenstein chooses to spend his money, and time? RUBENSTEIN: I’d say in my case, I am giving back money to my country, because I came from very modest circumstances. My parents didn’t have any money. They didn’t have any education. I rose up with a last name like Rubenstein to be able to do what I did, and I do feel that I owe this country, because I don’t think I could have done this in other countries. And so I’m giving it back in this way and into education and medical research. My biggest concern is I’m now 68 years old, and actuarial tables being what they are, it’s unlikely that I’ll live another 68 years, and maybe not even another 38 years. So I wish I had all the resources I have, the access, the willingness to get to do the kind of things I can do, and the ability to the kind of things I do when I was 37. I would give away all the money I have today, every penny, if I could be five years younger. DUBNER: Just five years, really, that’s quite an arbitrage. RUBENSTEIN: Life is so pleasurable. Even if you’re not wealthy. You know, money doesn’t necessarily make you happy. Some of the saddest people I know are the wealthiest people I know. And some of the poorest people I know are some of the happiest people I know. You know, Thomas Jefferson said, “Life is about the pursuit of happiness.” But he didn’t tell us how to actually get happiness. And it’s the most elusive thing in life, is personal happiness. Very few people achieve it. I think I’m personally happy. But you know, I think I was happy before I was wealthy, so you know, I don’t know that the wealth has made me happier. This concludes our special six-part series, “The Secret Life of C.E.O.’s” Thanks to David Rubenstein and all the other C.E.O.’s who spoke with us: Steve Ballmer, Carol Bartz, Richard Branson, Ray Dalio, Satya Nadella, Indra Nooyi, Ellen Pao, Jack Welch, and Mark Zuckerberg. We’ll be releasing many of their complete interviews over the coming weeks, so keep your ears out. Thanks also to all the academics who contributed their research and commentary, especially Jeff Sonnenfeld. Freakonomics Radio is produced by WNYC Studios and Dubner Productions. This episode was produced by Max Miller. Our staff also includes Alison Hockenberry, Merritt Jacob, Greg Rosalsky, Stephanie Tam, Vera Carothers, Harry Huggins and Brian Gutierrez. For this series, the sound design is by David Herman, with help from Dan Dzula. The music throughout the episode was composed by Luis Guerra. You can subscribe to Freakonomics Radio on Apple Podcasts, or wherever you get your podcasts. You can also find us on Twitter, Facebook, or via email at radio@freakonomics.com. Steve Ballmer, former C.E.O. of Microsoft. Carol Bartz, former C.E.O. of Yahoo. Nicholas Bloom, professor at Stanford University. Richard Branson, founder of the Virgin Group. Ray Dalio, founder and former C.E.O. of Bridgewater Associates. Satya Nadella, C.E.O. of Microsoft. Indra Nooyi, C.E.O. of PepsiCo. Ellen Pao, former interim C.E.O. of Reddit. 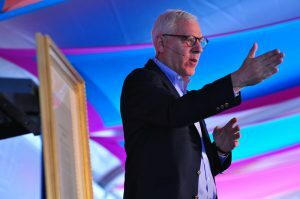 David Rubenstein, co-founder and former co-C.E.O. of the Carlyle Group. Jeff Sonnenfeld, professor at the Yale School of Management. Jack Welch, former C.E.O. of G.E. Mark Zuckerberg, founder and C.E.O. of Facebook. “Changing of the Guard,” Geoffrey Colvin, Fortune, (Jan. 8, 2001). « Previous PostNot Your Grandmother’s I.M.F.